About Bridgestone Flowtech America, Inc. 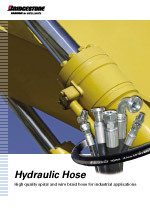 Hydraulic hoses are used in a variety of applications and industries where oil is contained within a system under high pressure. The control of this pressure via pumps and high quality hoses can result in the mechanical movement of part of a machine. 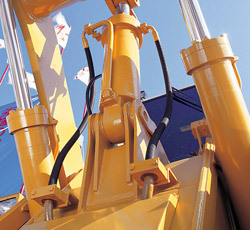 For example the lifting of the forks on a fork-lift-truck or the digging action of the boom arm of a hydraulic excavator all require the hose of hydraulic hoses. Bridgestone's high quality hose is available in wire braid or spiral wire constructions. The combination of this, plus high quality couplings and crimping will avoid leaks and lengthen the life of your hose which is tested to DIN, SAE & JIS standards. Bridgestone has a long and proven history of reliability, using advanced technologies for crimping, wire alignment and total product control. Depending on your location Bridgestone may supply hose direct or through a distributor for OEM supply and aftermarket supply through a network of distributors and agents. For more information contact your local Bridgestone sales office. All files are in Adobe Acrobat Format. To view them, you will need to download Adobe Reader. © 2013 Bridgestone Flowtech America, Inc.